p. Epus. Gloucestren. p. Epus. Winton, Cancellarius Anglie. p. Comes Oxon. Mag. Camerarius Anglie. Ds. Howarde de Effingham, Magnus Admirallus Anglie. p. Ds. Williams de Thame. p. Ds. Chandos de Sudeleye. HODIE 3a vice lecta est Billa, for the Repeal of a Statute made in the Seventh Year of King Edward the Sixth, against the great Prices and Excess of Wines, que conclusa est, dissentientibus Comitibus Arundell, Salopp. et Rutland, et Episcopis Wigorn. et Cicestren. et missa ad Communes, per Ricardum Reede et Johannem Godsalve, Milites. Eodem die, 2a vice lecta est Billa, for the Calling in of certain Pensions granted out to Religious Persons, who since the Time of their Dereinment have fortuned to marry. 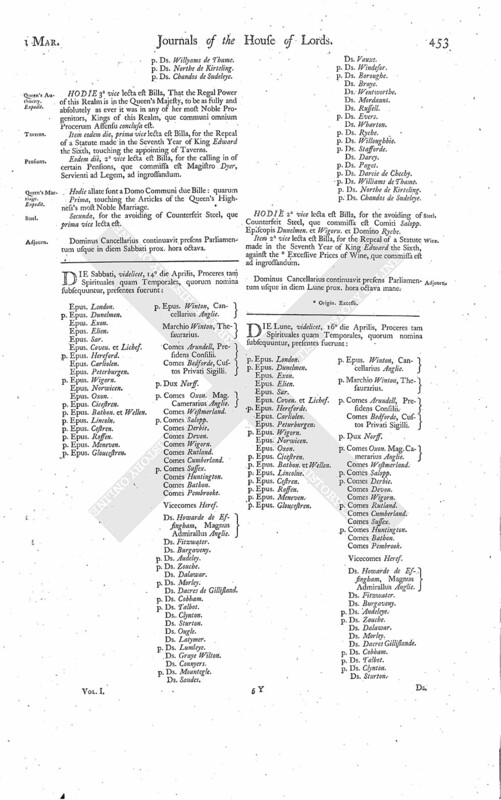 Item, eodem die, 1a vice lecta est Billa, for the Restitution and Assurance of the Manor of Gaywood and Rising to Thomas Howarde, Knight, otherwise called Thomas Howarde, Earl of Surreye. Prima, for the Reformation of Excess in Apparel. que 1a vice lecta est. Secunda, against the bringing in of certain Foreign Wares, que 1a vice lecta est. 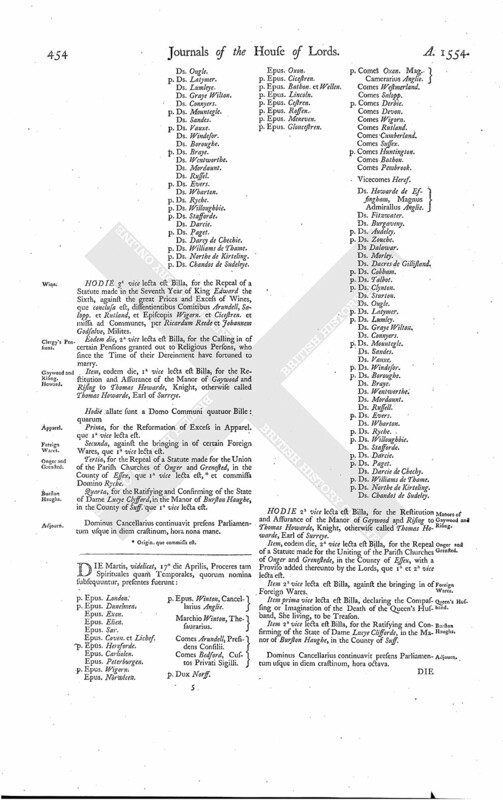 Tertia, for the Repeal of a Statute made for the Union of the Parish Churches of Onger and Grenested, in the County of Essex, que 1a vice lecta est, (fn. 1) et commissa Domino Ryche. Quarta, for the Ratifying and Confirming of the State of Dame Lucye Clyfford, in the Manor of Burston Haughe, in the County of Suff. que 1a vice lecta est. 1. Origin. que commissa est.